Excel is a very powerful tool, but if you are just getting started, it can be difficult to know what features you should learn first. Our new Spreadsheet Tips Workbook makes it easy for you to discover these critical tips and tricks at your own pace - whether at home, in school or on the job. 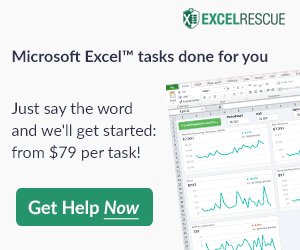 If you've already been using Excel for a while, you will learn how to save time and make your spreadsheets more powerful and effective. "I learned about so many things that I didn't even realize you could do in Excel. What made this a must-have for me was being able to learn and practice directly in Excel. When I started using the workbook, I knew almost nothing about how to use Excel. I would design forms using Adobe Illustrator and somebody else would create the spreadsheet, but now I can create them myself directly in Excel." The workbook is organized in a way that caters to both new and experienced Excel users. Each category begins with easy tips and then builds into more advanced and powerful skills. As you master a tip, you can mark it off, allowing you to chart your own course of study and remember where you left off. Many of the topics provide real-world examples of the tip in use in one or more of Vertex42's most popular spreadsheet templates. This can take you beyond the simple practice problem to a practical application. Gaining better Excel skills doesn't just help you with your every day work. If YOU are the person people come to when they need help, it provides job security and can help advance your career. So, if you want to become the local Excel expert, or if you just want to learn more about using Excel, this workbook the place to start. Pulling from years of experience in Excel, the creators and designers of Vertex42's library of templates have taken the tricks and tools that have been most useful to them and created a workbook that makes it easy for others to learn and practice these same skills - over 140 powerful Excel tips in all. The Spreadsheet Tips Workbook is something we want to continue to improve and add to. Your feedback will help us decide where to focus our efforts. You can post your feedback in the comments below, or send us email directly. Hi I just want to know how did you format the ‘STATUS’ column in your Invoice Tracker Template. @maddie: The formatting is done via a conditional formatting rule (go to Home > Conditional Formatting > Manage Rules). The drop-down list was created via data validation (Data > Data Validation).